the scent of green bananas: best of the worst. Posted by santos. This entry was posted on 20060411 at 9:50 PM You can skip to the end and leave a response. Well - it looks very pretty indeed. I had a turkey disaster recently too,if that is any consolation, except it was more than 20lbs. I left it too defrost for one day too many and it started to pong so I had chuck the whole thing in the bin! Ah yes, kitchen fiasco. My new thing is breaking plates and such. I recently broke 2 glasses and 2 plates, a Le Creuset ceramic dish, so I am trying not touch anything anymore. Your cake looks nice. Great consolation! Santos- you now must tell the story of the turkey disaster! Your cheesecake looks beautiful. Also, what is Sam referring to when she says "pong?" I have to add that word to my vocabulary! Completely unrelated to the topic - but i love the new look of the blog. Very nice. Looks delicious.. hope i can get your recipe..same as tokyo girl.."pong" after html language.. I still do not perfect my english... maybe it is like french "l'argot"
That is absolutely brilliant! Not only the design, but the flavors as well. Bravo Santos. Bravo! If it makes you feel any better it looks spectacular! ms. sixy, i hear ya. i've done that, but luckily not with a 20+ pound turkey! bea, oh no! not the le creuset! i've been through that phase before, but with glasses and coffee mugs--i have a whole set of cups without handles. miss astrogirl of tokyo, it's not much of a story. i didn't separate the meat from all the roasting juices, nor did i allow it to cool down properly before shoving it in the refrigerator, so it didn't cool down properly. when i woke up in the morning, it was all bubbly and pongy. and yes, isn't 'pong' an awesome word? it's a british colloquialism for "unpleasant smell" or "stench". it can be used as a verb, noun, or adjective, and can describe various states of, er, unpleasantness. hi miñetta, thanks! it's still under construction, but for the most part done. just working on that darned banner on top! pinkstar, if only you were here--mangoes, mangoes everywhere! ivonne, it is charming, isn't it? i would like it to look more distinctly flowerlike, but for a first attempt, definitely not bad at all. 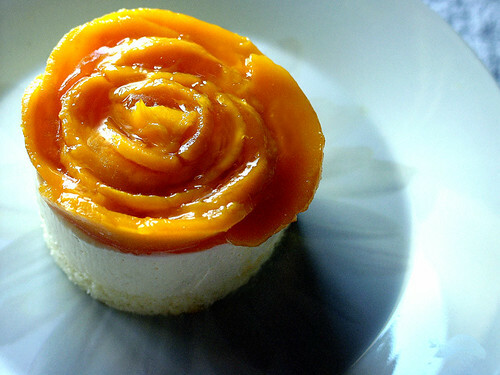 That is one beautiful looking mango cheesecake! I love it! I think we've all been through those funks where nothing comes out the kitchen right - you seem to be pulling out it very nicely though! I really like the mango flower! mm, the mango really makes the dessert; without it, it would be so 'meh'. anita, it's frustrating. nothing's quite turning out the way i hope, but at least i'm forced to improvise. you know, more than usual. where are your mangoes from? try to get philippine carabao mangoes from guimaras. they're the best! and they're also available blast frozen in "cheek slices" or cubes - just thaw and they're good as fresh! This cheesecake is a masterpiece! Mangoes...love them. Cheesecakes...love them more. Treadmills...hate them, but a good cheesecake is worth the hour of misery! As for "pong", my new vocab word...came home yesterday evening to find bowl of prepared tuna, which was used that morning to make lunch, was left on kitchen counter all day. Yes, it had left my home smelling quite pong. kayenne, i get mangoes locally or from the philippines--usually fresh, but when they're not available, i'll go for the frozen ones. Would the recipe work if I used a box of Mango jello powder, instead of unflavoured gelatin?